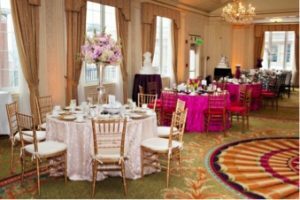 The 17th Annual “Brides of Distinction” Bridal Brunch & Fashion Show took place at the legendary Omni Parker House. Brides from all over the Greater Boston Area had the opportunity to meet some of Boston’s top wedding professionals and get inspiration for their perfect wedding. Floral design was by Winston’s Flowers, decor was by Rentals Unlimited and Boston’s top cake vendors, Montilio’s Baking Company, Konditor Meister and The Icing on the Cake, all presented their works and advised future couples about this season’s trends. The Guilded Harps provided an elegant background ambiance. Most brides have imagined what their wedding dress would look like since their childhood. Sometimes, brides need to try on dresses to know that’s the one! Guests at the Brides of Distinction Brunch had the privilege of having a dresses modeled for them presented by L’elite Boston with hair styles by Just Hair by Kris Pavao and make up by Alexandra Makeup Artistry. 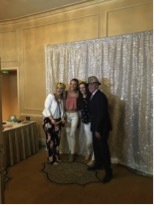 Entertainment Specialists provided a photo booth for the brunch. Billy Costa, radio and television host on Matty in the Morning Show, jumped in the photo booth with guests to commemorate the moment. The day was captured by Person & Killian Photography and Boston Weddings Magazine was the exclusive media partner. No doubt, the brunch inspired brides to create the wedding of their dreams and was a special day for the brides and their guests!